Once upon a time the Converse Chuck Taylor was synonymous with basketball. As the first shoe designed by and for basketball players, the Chuck Taylor had a virtual monopoly over the hoops market from the 1940’s through the 1970’s. 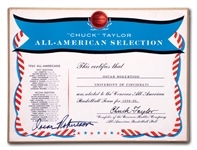 As the unofficial shoe of college basketball, Converse selected an All-American team from all the NCAA teams in the country. In 1960 University of Cincinnati Senior Oscar Robertson was again named to Chuck Taylor’s First Selection team for the third straight season, joining the Jerry West, Jerry Lucas, Lenny Wilkens, Walt Bellamy, Darrall Imhoff and four others. This is the special plaque that was awarded to Robertson in recognition of the honor. 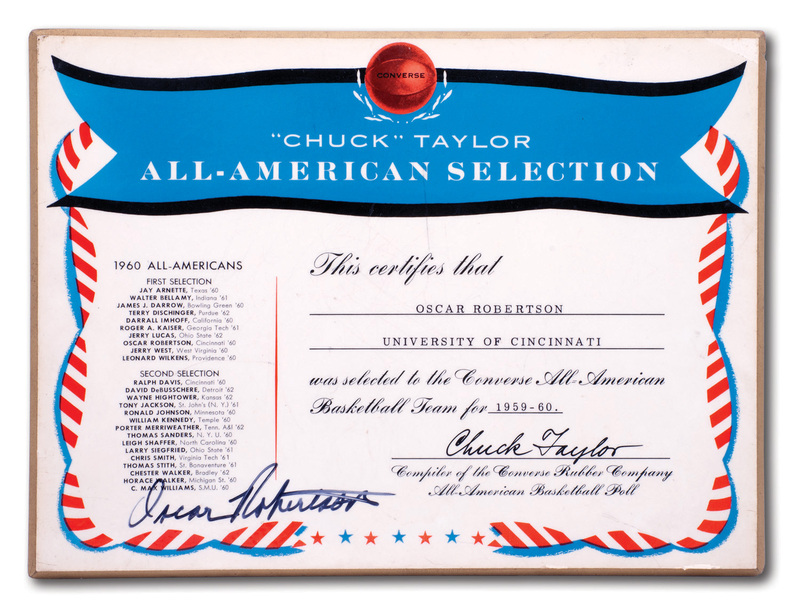 The colorful 1950’s-style red, white and blue graphics are complimented by Oscar Robertson’s black marker signature in the lower left along with Chuck Taylor's laminated real signature on the right side. The plaque measures approximately 8” by 11” and ¼” thick with a folded-in cardboard prop in the back to stand it up like a photograph for display. It shows moderate wear from age. A visually attractive and autpgraphed piece that marks one of the first of Oscar Robertson’s many awards. Includes LOA from Oscar Robertson.